I first encountered Ong Shunmugam's work 2 years ago at the Blueprint Tradeshow 2012, when Priscilla Shunmugam was still a young designer. I was rather struck by her strong aesthetic of mixing various Peranankan prints and fabrics, and crafting it into modern dresses while still retaining traditional cheongsam elements such as mandarin collars, a nipped waist cut and side slits. Fast forward two years and she has her own solo show at AFF and I am sure that this can be attributed to her steadfast commitment to her aesthetic and also her listening to the women whom wears her designs. For this season, Shunmugam drew inspiration from the book Madness and Civilisation by Michel Foucault and applied concepts of control, conformity and confinement to her collection. The color palette was kept to only blue and yellow, with a self-imposed rule that there must be mandarin collars on every look. 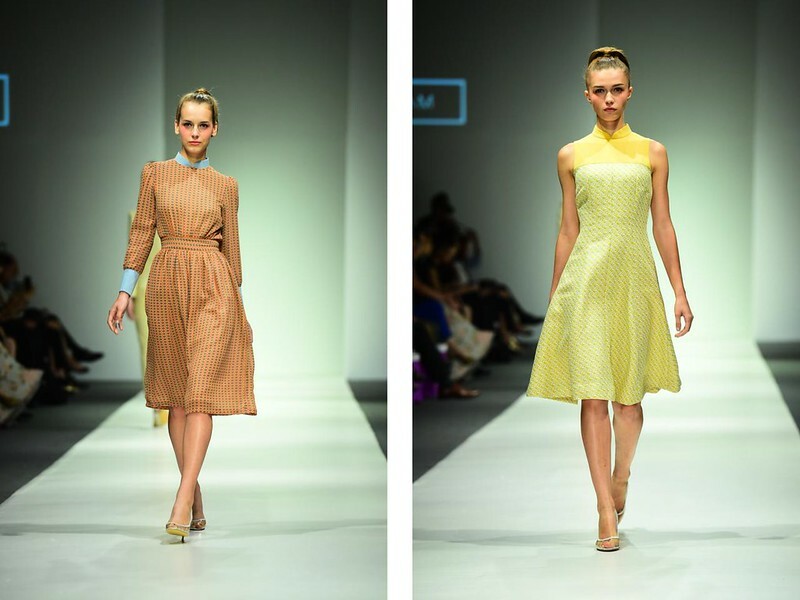 This translated well intoblue grey and muted yellow dresses with butterfly sleeves, which then progressed into A-line pleat dresses, mini playsuits and separates with crop blouses and culottes for the modern woman. I also particularly liked the slight emphasis on the shoulders, brought out through tailoring and color contrasts, which brought out a woman's natural curves and hourglass figure. For the second half of the show, Shunmugam went back to what she was familiar with - mixing prints on her classic cheongsam silhouette, which she has been doing so well for the past few seasons. I do have friends telling me that while they love her designs, the pieces are too memorable to be worn repeatedly and I do wish for her to display greater versatility as a designer for future seasons. 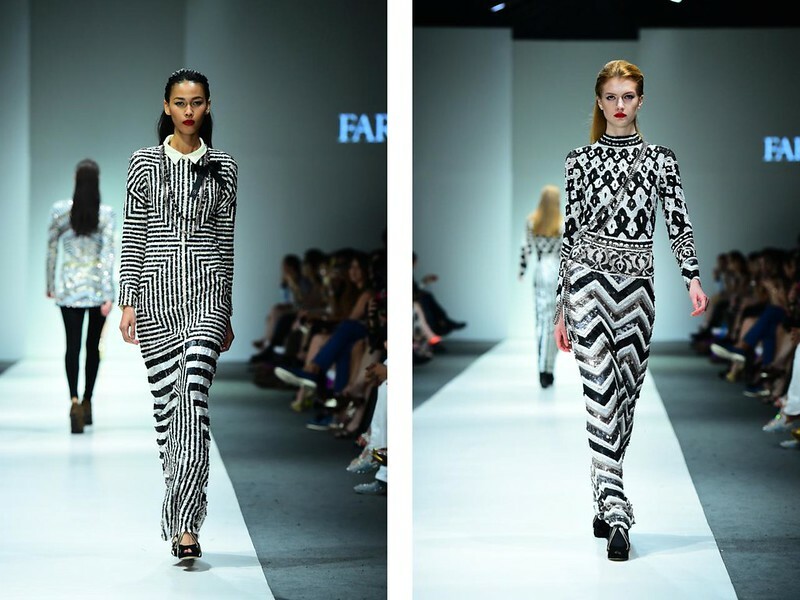 I will be frank - I wasn't familiar with Farah Khan and her label before her show at AFF. The designer surprised me with her mastery of sequins and beading - the entire collection featured looks crafted out from that. The sequined houndstooth and geometric print tunics really stood out to me for its originality, and it's hard not to marvel at the precision of the positioning of each sequin embroidered onto the tunics.The houndstooth prints were translated into mini shift dresses styled with leggings as well - very 60s, reminiscent of the Twiggy and Mary Quant Mod era. Mink collars and sleeves with fur accents were added to give a touch of luxe, with the latter half of the show progressing to longer hemlines. There was a hint of 1920s Great Gatsby reference with looks featuring sequined cardigans paired with pussybow blouses and a maxi chiffon skirts, as well as fringe micro flapper dresses. For the evening, the monochrome color palette was made high impact with geometric patterns printed on full sleeved maxi gowns. 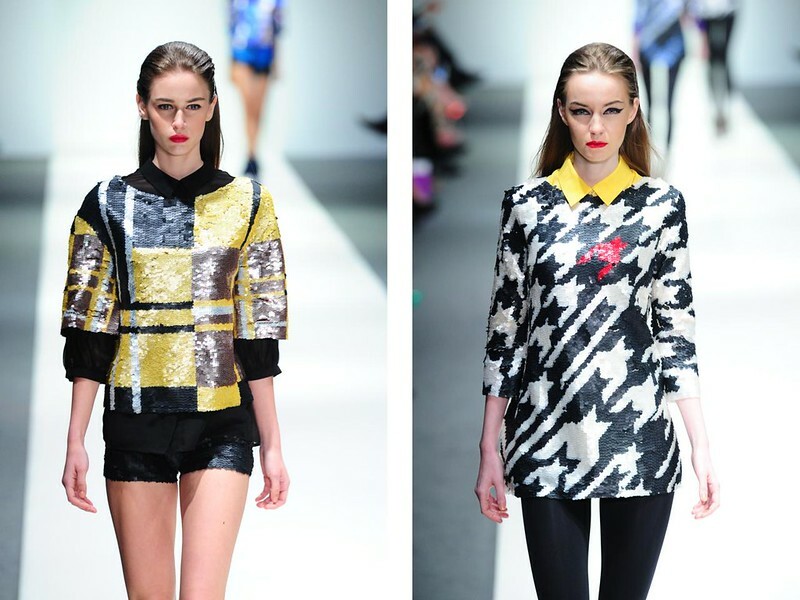 Altogether, a very tight collection that had a strong vision. Kudos to Farah Khan for pulling it off!